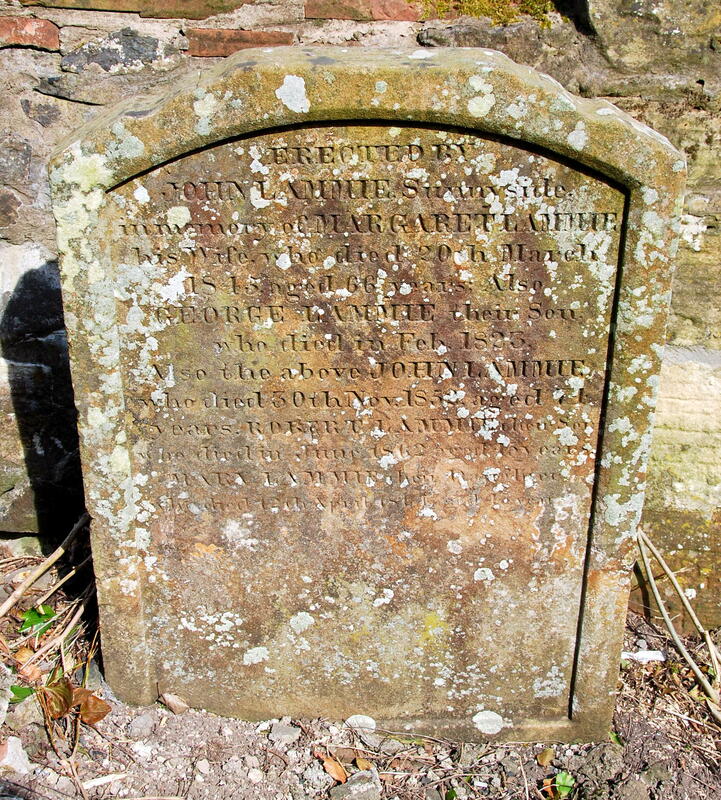 At the top wall of the Auld Kirkyard near the Kirkport entrance is the family plot of John Lammie and his wife Margaret Lammie who lived at Sunnyside farm, New Cumnock. Margaret was the mother the celebrated poet James Hyslop, his best known work ‘The Cameronian’s Dream’, inspired by the loss of Richard Cameron and his band of Covenanters at Airdsmoss. This branch of the Lammie family feature in ‘The Man’s the Gowd’ by Dr. James Begg , a fantastic account of his forebears, including his great-grandfather Andrew Lammie, younger brother of John Lammie and their parents Andrew Lammie and Marrion Taylor. 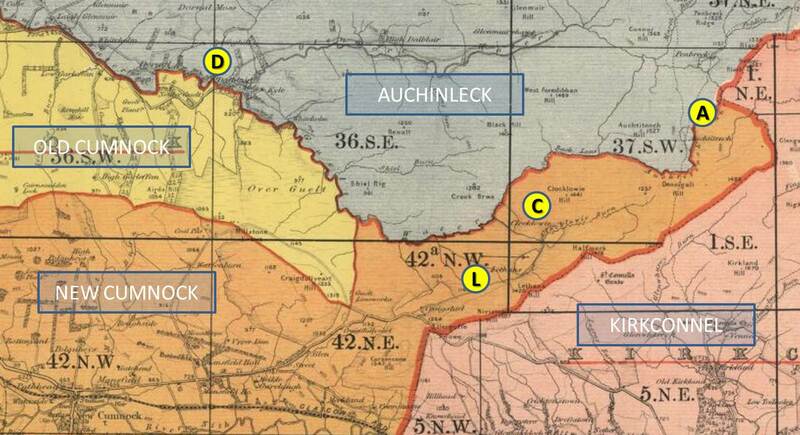 John Lammie later lived at Auchitinch a few miles north-east of Lethans, on the Auchinleck side of the New Cumnock parish boundary. Meanwhile his future wife Margaret Lammie, a second cousin , had given birth to a son James Hyslop at Damhead, Kirkconnel , the home of her parents George Lammie, a weaver, and Mary Thompson. In “Poems / by James Hyslop; ; with a sketch of his life and notes on his poems by Peter Mearns” , Mearns quotes from a letter by Mr. Alexander Muir of Paisley (1841) and gives an insight to how John and Margaret Lammie met. James Hyslop, doubtless was well versed in the Traditions of the Covenanters, perhaps at his grandfather’s George Lammie’s knee who for 65 years was an elder at Kirkconnel parish church. It was while, working as a shepherd that James would encounter the grave of Richard Cameron ‘The Lion of the Covenant” and eight of his followers that were killed on 22nd July 1680 by government troops at the Battle of Airsmoss. 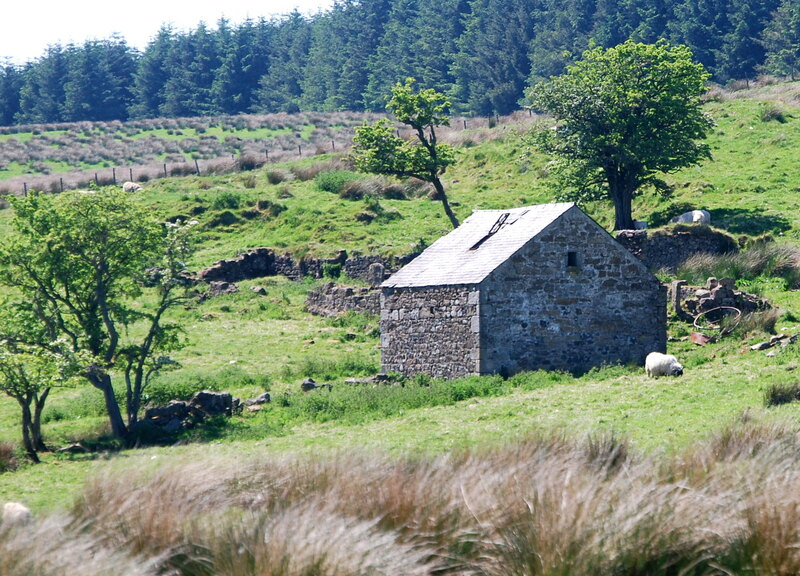 The setting inspired the young shepherd-poet’s best known work “The Cameronian’ s Dream” which he composed some years later at which time he was a shepherd in the Crawick valley in the parish of Sanquhar, at Corsebank and later Carco. It was morning; and summer’s young sun, from the east. Lay in loving repose on the green mountain’s breast. Glistened sheen ‘mong the heath-bells and mountain flowers blue. Was the whistling of plovers and the bleating of sheep. And drink the delights of green July’s bright morning. A chariot of fire through the dark cloud descended. And its burning wheels turned upon axles of brightness. A seraph unfolded its doors bright and shining. Have mounted the chariot and steeds of salvation. A crown never fading, a kingdom of glory! While at Sanquhar, Hyslop had opened an evening school ‘for the instruction of his humble pastoral associates’  marking the beginning of a career in teaching which took him to Greenock and later Edinburgh. In 1821 he was appointed the schoolmaster on HMS Doris (frigate) which was about to set sail for South America, returning some three years later. After a spell teaching in London was back to sea serving as a schoolmaster on the HMS Tweed (man-of-war) bound for the Mediterranean and then onto the Cape of Good Hope. The ship anchored at Cape Verde and while resting on the island of St. Jago, James Hyslop with a number of shipmates were seized by fever and he died on 4th November 1827, aged 29 years. 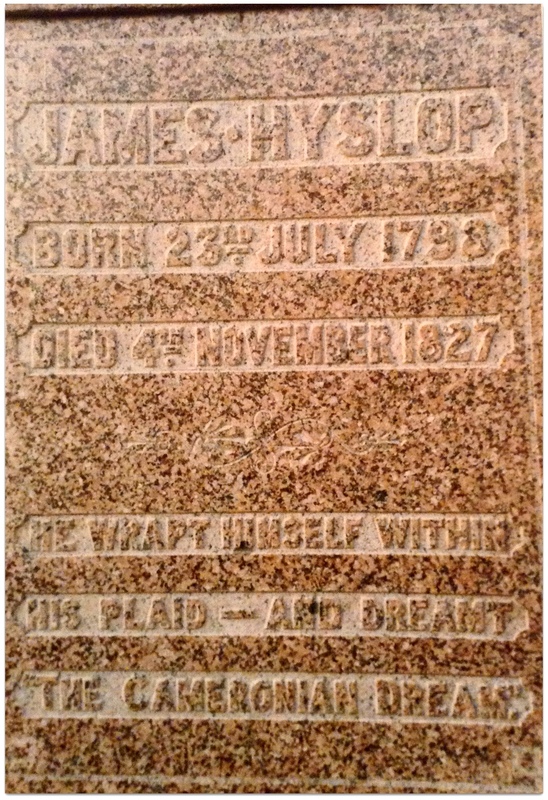 James Hyslop was buried at sea with full military honours. 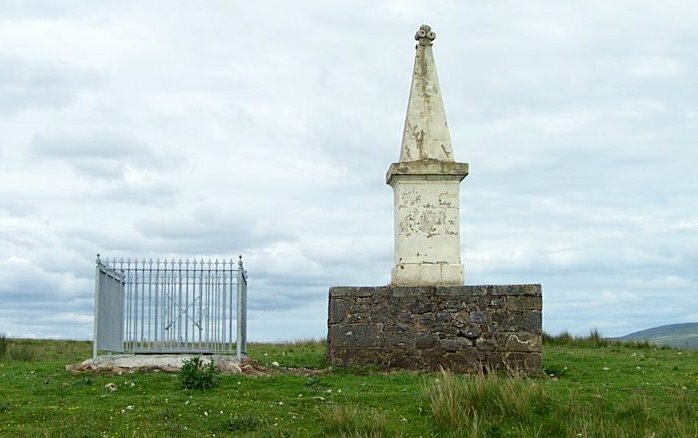 John Lammie and Margaret Lammie would be at Dalblair when they received the news of the death of James Hyslop. 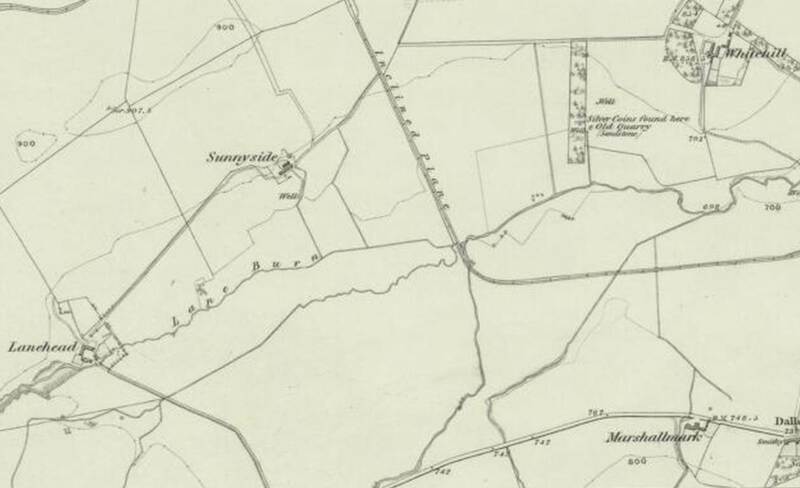 It is unclear when the family moved to Sunnyside farm near Lanehead in the parish of New Cumnock, but it must have been some time before 1845, when Margaret passed away and was laid to rest in the Auld Kirkyard. John, died seven years later, now a retired farmer, aged 72 years old . George died in 1832 and his name was doubtless added to the headstone in his memory at the time it was erected following his mother’s death. Robert worked as a grocer and lived in the parish schoolhouse at Afton Bridgend where his sister Mary supported him as housekeeper. After Robert’s death in 1862, Mary returned to Sunnyside earning some money from hand-sewing, only to pass away two years later. Brother and sister are buried in the family lair. David married (1) Isabella McMichael and (2) Jane Gall. He died aged 84 years at Hillend, near Corsencon. He lies buried in the Auld Kirkyard with Isabella and Jean. Thomson took over the reins at Sunnyside and here he raised a large family with his wife Jean McKnight. The family later moved to Cambusnethan, Lanarkshire. 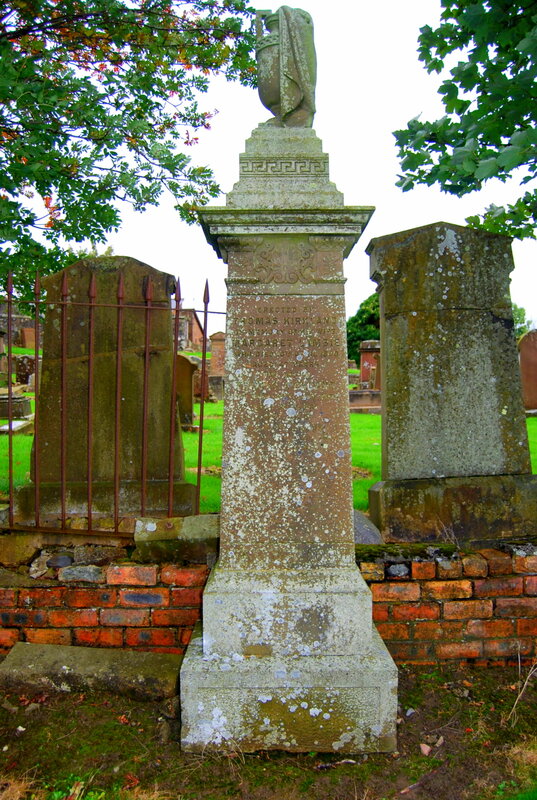 However daughter Margaret soon returned to New Cumnock after marrying local merchant Thomas Kirkland – both lie at rest in New Cumnock Auld Kirkyard. Sunnyside now lies in ruins . This entry was posted in Headstones and tagged Airdsmoss, James Hyslop poet, Lammie, New Cumnock, New cumnock Auld Kirk. Bookmark the permalink. Thank you for this fascinating article. I’m not 100% certain but I think William Lambie born at Damhead in 1802 married Margaret Orr at Muirkirk in 1828 and went on to have several children including Thomson Lambie who I am descended from. William Lambie, shepherd, died at Cambusnethan aged 81 in 1883 and his parents on his death certificate were listed as John Lambie and Margaret Lambie (nee Lambie).